The start of the day at nursery is crucial for parents, children and nursery staff alike. It is a time potentially fraught with tension as the parent needs to leave a child and get to work and a child needs to leave their parent for the day. There are lots of comings and goings with perhaps car-seats, bottles, nappies and feeds being handed over, as well as short discussions about a particular child’s needs for the day. Therefore, the way arrivals are handled can have a huge impact on how the whole day runs for everyone. 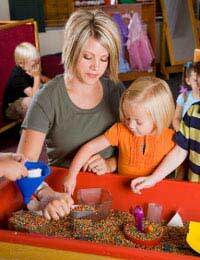 It is really important, particularly for larger day nurseries, that the start of the day is well organised. Staff should have arrived and be set up and ready to receive children at least half an hour before opening. Rooms should be warm and cosy in the winter months, bright and light in the summer, with nursery nurses ready with a gentle, ‘settling in’ activity to occupy the early arrivals, whilst all children are booked in. Security is obviously of paramount importance when there is so much activity and people arriving and a strict ‘booking in’ procedure along with verification of who will be collecting the child late should be followed. An appropriate member of staff, such as the Nursery Manager or Deputy, should be stationed at the main entrance, ready to welcome each child, and their carer, as they arrive and book them in. The point of separation can be very difficult for some, and should be handled in a sensitive, yet efficient way. The nursery nurse, who knows the child best from their sector, should be called to collect each child in person, greeting them with a wide smile. This initial contact is important for a child to feel secure and that it’s ‘OK’ to go with their nursery worker. A good nursery nurse will immediately start interacting with that child and if needs be, help distract them from their Mum or Dad leaving, and entice them through to their room. If the child cries, the nursery nurse should comfort them appropriately and stay with them until they feel calm and have made the emotional transition from home to nursery. As well as their children, many parents also find the process of leaving their child very hard, particularly if using a day nursery might not be their preferred choice. If they see their child crying, it can be heartbreaking for them. The best policy for the parent here is not to let their child see that they are upset. The nursery manager might then allow the parent to remain in the nursery, but concealed from view of their child, until they can see that their son or daughter has settled happily into their routine. Many nurseries use a web cam or similar mode of technology so that the parents can watch their children unobserved. This helps settle the parent and helps them depart for the day more confidently. Once all children have been booked into the day nursery, the welcoming procedure might continue, by bringing the older children together to greet them all as a ‘family’. This time might be used to explain what activities they will be doing in the morning, listening to news, singing a song, talking about the day of the week, the season, the weather and so on. Alternatively, if most children have breakfast at the nursery, it might be a pre-cursor to taking the children for their meal. Time and effort spent welcoming children at the start of the day in a caring and organised way will produce positive results for everyone and allow the rest of the day to proceed more calmly.